Edinburgh Scouts support the Mains Christmas Lights switch on event. On Saturday 1st December the 30th Craigalmond Scouts spent the day making sure the event was successful. They helped put up tents, prepare the site to make sure everything went smoothly and raise money. 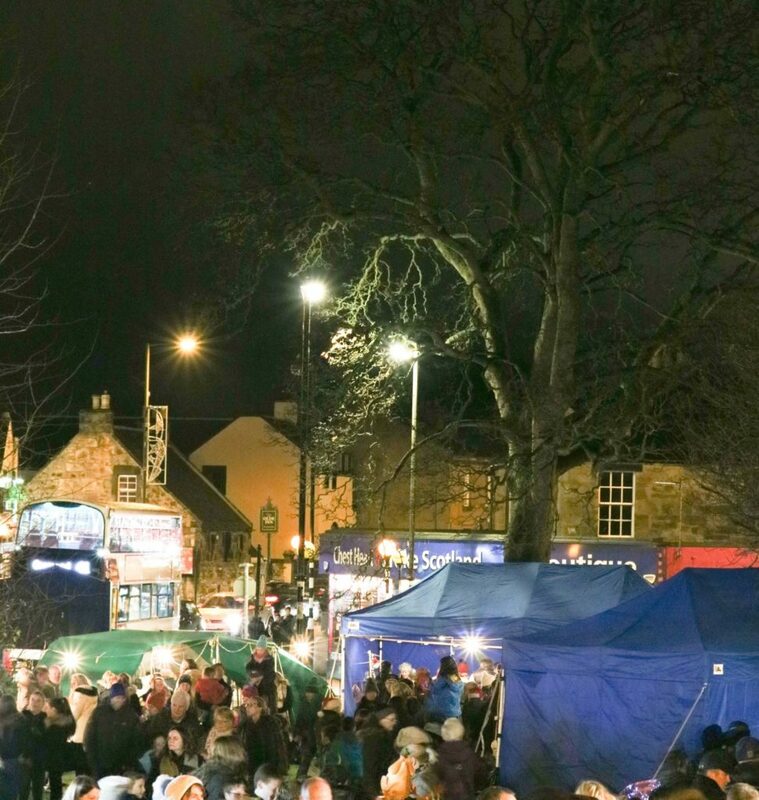 The lights were switched on at 7.30pm and cheers were made throughout the village. Applications for the 2019 National Scout & Guide Symphony Orchestra and Concert Band (NSGSO and NSGCB) course are now open. The course and concerts are based in Stourbridge, West Midlands and runs from Sunday 28 July – Sunday 4 August 2019. Last year 142 young people attended – a record year again. The course is hosted by Birmingham Scout County in conjunction with Girlguiding Birmingham. The Orchestra is now in its 44th year, and after the success of forming the Concert Band three years ago it will again run alongside the Orchestra. The NSGCB were re-branded last year with their own identity. However both groups are based together and although they have separate rehearsals and concerts they come together for a massed finale item and all accommodation and social activities. So there is a choice of 2 ensembles to apply for. There is slightly different criteria and instrument choices for each – please see below and also our website for specific information. To apply for the 2019 NSGSO or NSGCB Course and to find out lots more detail go to apply.nsgso.com. – A Member of the The Scout Association or Girlguiding. Please note: String players who are Grade 4 may be accepted under certain circumstances. Please note: Applicants between the ages of 26-30 will be considered in the event that a section is under-subscribed. The cost of the course is £510, payable in four instalments. The course cost includes full board, accommodation, rehearsals and workshops with a professional conductor and sectional tutors, uniform for new members, transportation during the week and social activities. You just need to transport yourself to Stourbridge and after that everything else is paid for. We can pick you up from Stourbridge station or Birmingham airport. For help with funding applicants should contact their group first, then district and then region. Applicants can of course do their own fundraising for this event. We can help you with contact details if you would like to email. A small amount of money is available in grants from NSGSO/NSGCB. For anyone wishing to use this course for their DofE, QSA or QGA residential then this year must be the first time that they have attended. Applicants will hear before the New Year if they have been successful. Please email jill@nsgso.com with any queries that you have. 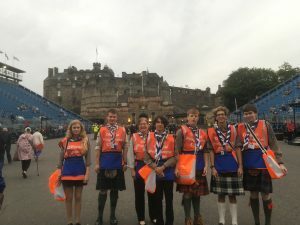 Tourists visiting this year’s Edinburgh Military Tattoo received a good Scottish welcome from a team of Explorer Scouts and Adult members who volunteered to sell programmes and merchandise to the international visitors attending the world famous event at Edinburgh Castle. As they have done since the first Tattoo in 1950, members from across the Region were able to enjoy a unique opportunity to be part of the Tattoo and help to raise money for scouting in South East Scotland, with volunteers coming from a wide range of roles with Section Leaders, Group Scout Leaders, District and Regional Leadership Team members joining Explorer Scouts to cover performances throughout August. If you would like to find out more about volunteering at the Edinburgh Military Tattoo please email Sue Liddle at sueliddle@sky.com. 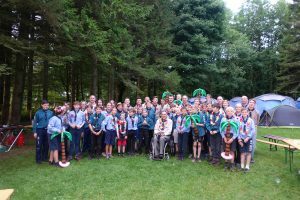 Our 2018 Summer Camp was held at Culzean Country Park Scout Camp in Ayrshire. Given the weather had been glorious for what seemed like months and months we were looking forward to a dry camp. On arrival, the advance party had managed to do a great job putting up the marquees, mess tents and leader tents, despite a tyre blow out on the way there. 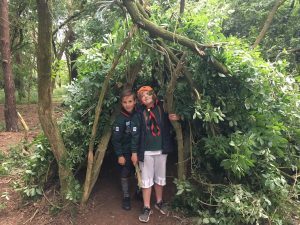 On arrival, the 32 Scouts and Leader team put up the patrol Stormhavens and dining shelters just before a 48 hour monsoon arrived, which turned rock hard grass into a near swamp in no time at all!! The accompanying wind managed to fell a sizeable tree but fortunately no-one was hurt. On the Saturday night we introduced our theme “Stranded on a Desert Island” with some familiar and not so familiar islands – Treasure Island, Coral Island (from Lord of the Flies), New Switzerland (from Swiss Family Robinson), Isla Nublar (from Jurassic Park) and Monuriki (from Castaway). The Scouts spent the first evening drawing maps of their islands and creating wooden signs from driftwood to name their patrol area (no camp fire given the ongoing rain). On Sunday, after the first breakfast cooked by the Scouts we had our first patrol inspection (to set the camp standards) and then we visited the grounds in Culzean. Unfortunately the rain continued to pour so we persuaded the camp trolley bus service to take us on a covered tour of the site before they kindly went out of their way to drop us off at the camp. We improvised with a Fifty Question Challenge which set the basis for our Patrol point’s challenge. As the rain eased we did some site maintenance, clearing the felled tree as well as removing an old fence and gathering mounds of wood for future camp-fires. Monday saw us offsite at Maidens for our water sports day – the rain had eased and the sun shone for a while, with a glorious backdrop of Arran, including the Holy Isle and Goat Fell. The Scouts did a full on day, paddle boarding, kayaking and canoeing. Our Sea Scouts honed their skills whilst the others scouts learned new water skills, albeit a couple of Scouts unfortunately did not avoid jellyfish stings!! On the evening we did a “Lost at Sea” team building exercise where the Scouts had to select 12 from 32 items which would help them survive stranded on an island – after much debate and discussion, the selections were made with “positive attitude” being the unanimous favourite, followed by fire-lighting equipment, tarpaulins for shelter, knives, rope and safety pins to catch fish (or in one case, birds!!). We were also able to have our first camp fire, with the young adult leaders doing a fantastic job in engaging the scouts in their favourite camp songs. Scout Skills day took up most of Tuesday and again the Scouts learned a range of new skills including rope and pulley work (towing the minibus and pulling down dead trees), hammock and shelter building, axe and saw work (very popular), navigation and first aid skills (which were needed when the Scouts used their pen-knives for whittling their woggles!). In the evening we had to abandon our Beach BBQ given the rain, so we cooked in the dining shelters, although we did manage to cook dough bread and smores on Swedish Torches. On Wednesday we split up, with the older Scouts preparing for and undertaking their overnight expedition and the younger Scouts spending the day in the grounds of Culzean. The expedition to Turnberry was undertaken in horrendous conditions, so the tarpaulins were abandoned and the tents erected. Despite the conditions the Scouts and Leaders stuck it out and came back Thursday morning, drenched and exhausted but very pleased they had met the challenge. 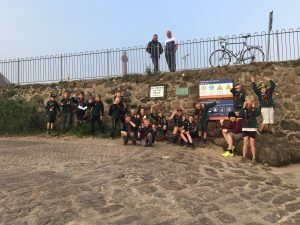 The younger Scouts had a great day, making huge SOS signs on the beach using seaweed, rocks and other materials as well as spending an hour or so digging for treasure hidden at the end of a large rope buried in the sand. Unfortunately no fortunes were made. In the evening the younger Scouts searched for “unlabelled” tins for their dinner – macaroni cheese, meatballs, peaches and custard was the best find!! That evening we had a Desert Island themed competition, the most competitive event being the limbo. 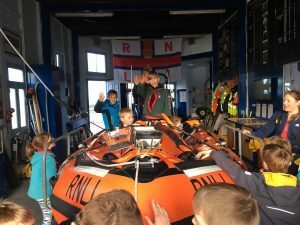 On the Thursday afternoon, we all went to Girvan and had a brilliant afternoon at the RNLI station. Callum and his fellow volunteers showed us around their brand new state of the art boat costing £2.1m pounds as well as demonstrating how to put on their gear. The Scouts were really attentive, asked great questions and we were pleased to hand over a donation of £200. After an hour of playing in the Girvan play park, we all had a massive meal of fish/sausage/haggis suppers in the evening sun (actually it was drizzle but we didn’t care!!). The local seagulls and some young teenagers tried their best to disrupt our meal but we all enjoyed a great feast. We finished the day with a massive camp fire where we burned all the material we collected earlier in the week followed by more camp songs. We started to strike camp on Friday, trying to take tents down dry between the showers. The young adult leaders brought together a great “Olympics” with much competition to try to gain those points which would win the prizes. In the evening, Karen, our camp cook, surpassed the excellent service she had already provided during the week, with a superb BBQ banquet meal of kebabs, burgers and chocolate cake. We closed the evening with our GSL, Graham Cullen, presenting the Chief Scout Gold Award to 7 Scouts who after 4 plus years of attending Friday Scouts, engaging in activities and challenges and attending Easter and Summer Camps achieved the ultimate award – massive congratulations to them all. Despite a little drizzle Saturday we were able to strike camp in good time, leaving the camp in good order and getting back to the Kirk at the target time. We had lots of help from parents in putting the kit away, and lots of volunteers to dry our tents. So a great camp, in a wonderful location and the “positive attitude” certainly got us through the persistent rain. The Scouts were very well behaved, engaged in the activities, challenges and camp singing and gave the leaders very little bother. They were supported by an extensive and committed Leader team to whom I say a massive thanks. 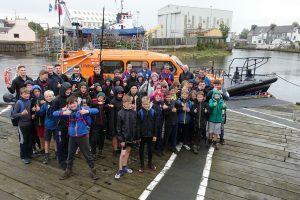 As you may be aware the Young Leader (YL) scheme has recently started undergoing some changes including the release of new Explorer Scout YL (ESYL) logbooks. We are excited to announce that the new ESYL Logbooks are now available to purchase from the Scout Shop. To facilitate the transition from the existing YL training scheme to the new one and avoid any negative impact on our invaluable YLs there will be a phasing in period. The inclusion of the new Module J – “Communicate it” will be phased in and, up until May 2019, any existing ESYLs will not be required to complete this module. After this time this module should be included in the training as a requirement for the completion of the scheme and award of the ESYL belt. More information on the updated ESYL scheme can be found at: https://members.scouts.org.uk/supportresources/2628/resources-to-support-the-scheme?cat=9,98&moduleID=10 or by contacting youngleaders@sesscouts.org.uk. A huge thank you to everyone in the region who continues to help and support our invaluable ESYLs.